This Agreement is entered into between the Warroad Marketing Committee (hereinafter “ADMINISTRATOR”) and the entity listed in the following section (hereinafter “APPLICANT”). Which logo are you requesting one-time use of (see options above)? The ADMINISTRATOR has developed guidelines on best practices for use of the two word logos that offer a refreshed and consistent font to represent the community. 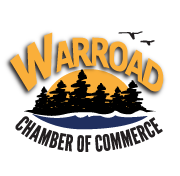 These two word logos include the bold Warroad, Minnesota and the Warroad with the Minnesota state outline in the D. The ADMINISTRATOR uses this document to authorize use of these logos and to keep a record of use. These word logos are collectively referred to herein as the “LOGO”. “TERRITORY” used herein shall refer to the United State of America. ADMINISTRATOR hereby grants to APPLICANT, and APPLICANT accepts a royalty free, non-assignable, non-transferable, non-sublicensable, and non-exclusive right and license to use the LOGO in the TERRITORY in connection with the manufacture, sale, and distribution of the LOGO for a ”ONE-TIME USE”. ADMINISTRATOR may review specimens of the LOGO sold by the APPLICANT under one or more of the LOGOS to ensure compliance with ADMINISTRATOR’S quality controls and to ensure proper use of the LOGO. APPLICANT acknowledges that ADMINISTRATOR is the sole and exclusive owner of all right, title, and interest in and to the LOGO in the TERRITORY, as well as to all combinations, forms, and derivatives thereof. APPLICANT acknowledges the substantial value and eminent goodwill associated with the LOGO and agrees not to do any act or thing that might in any way adversely affect any rights of ADMINISTRATOR in and to any of such LOGOS or which might reduce the value thereof or detract from their reputation, image, or prestige. ADMINISTRATOR shall have the immediate right to terminate this Agreement and any other rights granted to APPLICANT hereunder, by written notice, for any reason including if the APPLICANT uses any of the LOGO in an unauthorized or improper manner or if APPLICANT ceases to exist or is involved in bankruptcy. The APPLICANT may terminate this Agreement with written notice of such intention to terminate. APPLICANT hereby indemnifies ADMINISTRATOR, its officers, employees, and agents for any claims (including but not limited to, product liability, wrongful death, and negligence claims), suits, losses, expenses, damages, or other liability including attorneys’ fees and related costs arising from, caused by, relating to, or incident to the manufacture, packaging, advertising, sale, and use of the LOGO. This indemnification shall survive the termination of this Agreement. This Agreement shall insure to the benefit of the ADMINISTRATOR it’s successor and assigns but will be personal to APPLICANT. ADMINISTATOR shall have the absolute, unfettered right to transfer this Agreement and its rights and obligations thereunder to any third party upon notice to the APPLICANT. Once approved, we will send you the logo and Warroad usage guidelines.